With the Google Wave craze all around, the amount of things you get to do with it and more new users getting to check out the Wave each new day, security and privacy are often a big concern for many users. After all Google Wave is yet another social networking tool that lets you do things (or collaborate) with your peers and partners. 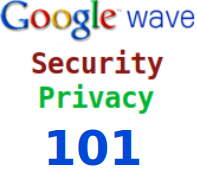 In this article we will tell you about a few tips on user security and privacy while using Google Wave. Who all can see your waves? In the screenshot shown above, you may see that the wave has public access as shown by the wave status message. This means anyone having a Google Wave account can view such a Wave (i.e. the one which has public access). Quick Tip: In order to make any wave public you should add the user: [email protected] as a participant in the wave by clicking on the + button in the participants bar at the top. You may happen to take part in a Wave that has users from other part of the world and you do not know them personally. So what the other Wave users can see is your Google Wave address, the name associated with that address, and other information that you have opted to share with others for eg. your wave account avatar. When you remove yourself from a wave, the content you contributed to it is still visible to the wave's other participants and you appear to them as offline. When you delete a wave that you created, the wave is queued for deletion from Google's systems provided all participants who have access to the Wave remove themselves from the Wave. You could access third party extensions on Google Wave in two ways: either you add a third party extension or you participate in a wave created by someone else and it uses a third party extension. In both cases some privacy concerns are involved. For example, if you publish photos to a website that are contained in a wave using an extension, it would have access to all the photos in that particular wave, irrespective of the fact who added them. This is similar to how any recipient of images attached to an email message could post the images to an online photo-sharing website. Google does NOT read your waves. Neither does it modify or share your Wave. You are the sole owner of your wave. Google collects information about your account activity, your interaction with user interface elements and links, your IP address, and other Log information. As a participant on a wave, your Google Wave address, the name associated with that address, and other information that you have opted to share with others is visible to all participants of that wave. If you select a picture (avatar) for your account, it will be visible to other Google Wave users.